Our Australian made Soil Samplers are manufactured locally from tough 316 stainless steel. The samplers have a 20mm (3/4") internal diameter with “T” handle and are available with either a 30cm (12") cut-out section or strait through - whichever best suits your needs (first of the two in the photo). Our Soil Samplers are available in lengthes of 26" (660mm) or 36" (900mm) long. Other lengths may be available as a made-to-order option. Larger diameters eg 25 mm ID or 40 mm ID can be supplied. Soil samplers come with a sturdy “T” handle. An optional extra, a heavy-duty top that can be hit with a hammer, can also be supplied. 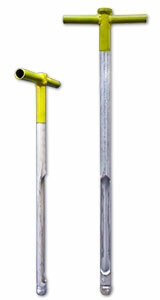 Australian made soil samplers with auger head. Close-up of the sturdy auger head. Note: Custom length shafts can be manufactured to ordered.